Today’s blog comes from our administrative assistant, Brittany! San Diego native, born and raised, Brittany it goes without saying that she loves our beaches and 4th of July. To get you jazzed for the long holiday weekend ahead, she has put together some of her favorite waste-free tips for a day at the beach! Looking for something fun to do for the upcoming patriotic holiday? Why go anywhere else when you live in a city full of beautiful beaches! The 4th of July has always been one of my favorite holiday’s to spend at any beach in San Diego. With so many people at our beaches, there is one thing that tends to be left behind and that’s trash. 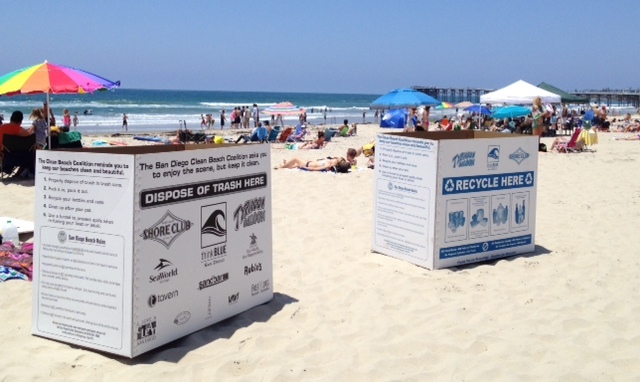 This 4th of July, Clean Beach Coalition will have large trash and recycling bins located at Ocean Beach, Mission Beach, Mission Bay, and Pacific Beach to give every beachgoer a chance to continue to keep the beach sparkling clean! Last year alone, the CBC bins collected 96,860 lbs of trash and 2.8 MILLION pounds in the last 8 years. Pretty impressive, right? In order to prevent more trash from ending up on our beaches this holiday, I wanted to share some of my favorite things to pack in order to stay green while still rocking red, white, and blue! Keep an eye out for our huge trash and recycling bins. They’ll be hard to miss so be sure to put them to good use! The key to staying green is to pack up all your reusable items to prevent any trash! Here is my easy to follow step-by-step guide to a waste-free weekend! For starters, instead of using a Styrofoam cooler, bring a more durable reusable cooler. Not only will it last you years, it prevents any Styrofoam pieces from ending up on our beaches and the Pacific Ocean where it will never biodegrade. Plastic pieces are easily mistaken for food by marine animals causing serious health issues. Here are pieces mixed in with sea kelp recently found at a cleanup. Fourth of July Rice Crispies Treats are a favorite of mine. Not only are they easy to make, but you can put them in a reusable container and be set to go! Check out the recipe here! Fruit Kabobs! All you need are some wooden skewers, strawberries, bananas, and blueberries and you have an ecofriendly, patriotic snack! Fruit kabobs are the perfect plastic-free treat! Although the skewers will eventually go in the trash, wood will naturally biodegrade with time, unlike plastic. 3. Feeling thirsty? Fill up a reusable water bottle and bring it with you! Did you know American’s throw away 35 billion water bottles a year? It’s important to reduce bringing plastics to our beaches because once plastic enters the ocean, it is extremely difficult to clean up. Don’t have a reusable water bottle? Check out some of ILACSD’s reusable water bottles online! Brittany always carries her reusable water bottle wherever she goes whether it’s the beach, a park or work. Check out our merchandise to get you own ILACSD gear to sport around town! 4. Don’t have anything to pack up the rest of your goods? Use a tote bag! My favorite tote bag can be washed and reused over and over again. Do your best to not bring plastic bags to the beach, not only are they not recyclable but if blown into the ocean, marine mammals can accidentally mistake them for food. Still not ready to end your beach time this weekend? Come show your patriotism in a new way with I Love A Clean San Diego on July 5th for the Morning After Mess Cleanup. From 8-11am we will clean up the excess trash left behind on Mission Beach from the holiday celebrations. Plus, the first 400 volunteers will receive a free tee from REI! Whether you decide to stay in San Diego this 4th of July Weekend or travel elsewhere, please enjoy the scene, but keep it clean. Have a safe and wonderful 4th of July! You are a star. Keep it up! Thank you.